EffectsMTL, one of the visual effects and animation industry’s premiere conferences, took place in the bustling Canadian city of Montreal this week, where SpinVFX and SpinVR joined other major international studios to meet the best in artistic and technical talent. Attended by over 1500, industry experts and exhibitors, SpinVFX was a popular stop for many who were interested in joining our team, and learning more about our work. Head of Creative Resources, Leah Jaikaran led the recruitment team, along with VFX Supervisor, Andrew McPhillips. Together, they discussed SpinVFX’s renowned pipeline process, the calibre of our nearly 200-strong team, and the experiences of working on some of our most popular productions, such as Game of Thrones, Disney’s Descendants 2, and The Expanse. Not to be outdone, SpinVR was represented by Creative Director Dave Cardwell, who spoke to interested candidates about our work in virtual and augmented reality technology. Visitors to the Spin booth were keen to discuss the ways in which SpinVR’s web-based platform, BRIOVR, is making it easier than ever before for users to access AR/VR technology. Best of all, the Spin team enjoyed the opportunity to talk about the many benefits of living and working in Toronto, the city where our headquarters are located. Overall, the Spin team met over 200 experienced and talented individuals at the two-day long event. This is SpinVFX’s first year participating as an exhibitor at EffectsMTL, and it has proven itself to be an integral meeting ground for studios and artists alike. For more information about career opportunities, please visit our careers page. 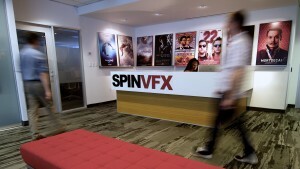 To schedule a studio tour, apply for a role or contact our recruitment team, please e-mail careers@spinvfx.com.